It didn't take much to pull this all together--just a little colored pencil shading on the stamped images! I put a little puddle of Multi-Medium on scrap paper and grasped the sequins with my tweezers (super easy when they are cupped like these) and swiped them through the glue and plunked 'em onto the card. Everyone needs a 5MQ like this in their card-makin' aresenal. Side note: 5MQ stands for five minute (card-makin') quickie. I have a thing for birds. I just... like them. BTW, just in case you've never seen it, here's a reference: Put a Bird On It, Portlandia. Cracks me every.single.time. Anyhoo, I had to have this Aviary set by Pinkfresh Studio, just cuz of the birds. *sheepish shrug* All the flora in the set is a bonus. *chinkle* There's a matching die set for it, but I don't own it so I fussy cut the birdies. It's kinda rare for me to actually stamp on colored (not white??? *gasp*) card stock, but for this one, it worked out particularly lovely. Bonus? That Twilight Versafine Clair ink is bleed proof so you can watercolor with it. I finally bought the new Pinkfresh Studio Watercolors--they are quite lovely--WOW'd me big time! 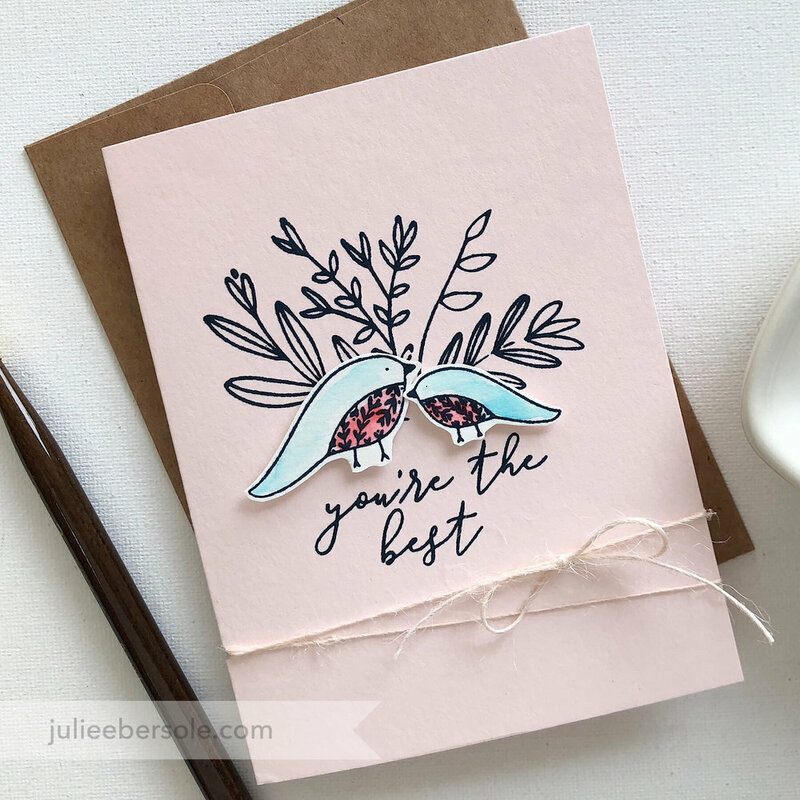 Stamp assortment of twigs/branches and sentiment onto a pale rose card with Twilight (navy) ink. Stamp birds with same Twilight ink onto scrap of watercolor paper. 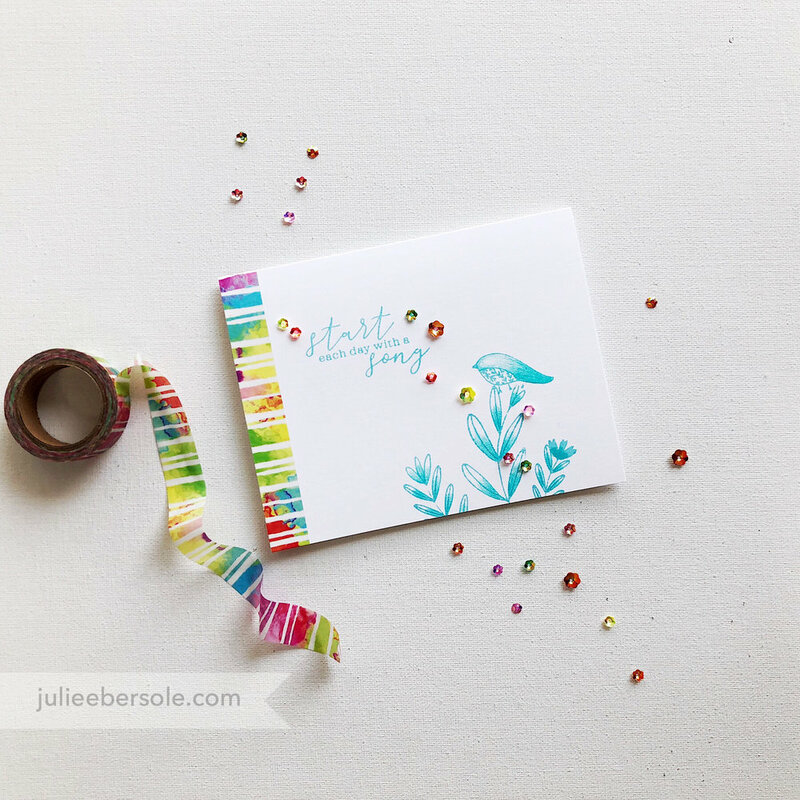 Watercolor birds and trim out; 3D mount to card front as shown. Punch 1/8" hole into gutter crease of card, thread twine through, wrapping twice around card front and tie into a bow.